The legendary Yorkshireman who brought Nishikigoi to the World. There is no doubt at all that Aloysius Greenhalgh’s grandfather Jabez had no idea of the acclaim that would follow years later after his first spade was offered to a neighbouring landowner in exchange for some rent Jabez owed to him. It is said that this all took place in the early 1800’s although, despite the many avid spade researchers around the world who have since tried to piece together the actual truth of the origins, there are still too many unanswered questions to give credence to any of them. The confounding thing is, this intensive inner love of spades has continued right through all the generations of the Greenhalgh family since those early times and right up to the present day. Some say that the original ‘workshop’ was a rude excavation, propped up by pine trunks, into a hillside near his croft on the land he worked for his landlord. It was said to be quite close to Gordale Scar near Malham in the Yorkshire Dales, if that was the case it has never been located to this day. Again, those early days are sketchy but no doubt the first time the surrounding villagers became very aware of the success of Jabez was when the influx of Irish labour came to England and started work on the revolutionary network of canals that were needed for the heavy industries starting all over the country. Sadly Jabez never lived long enough to enjoy the fruits of his passion but it was noted that his estate on his passing was recorded as being ‘of great significance’ when it was handed over to his only son Roger in 1847. It has long-since been accepted that, almost exclusively, spades designed originally by Jabez and later to be continued by his family, excavated our famous network of canals. Even more surprising it is said that, up to 80% of those early spades produced, can still be found today in many museums the world over. I confess, I have often wondered what Jabez would say if he knew the current-day value of some of these highly-treasured collector’s items! Yes, no doubt the generations of Greenhalgh who continued the tradition, not forgetting the very shrewd business lady Nellie, were all a part of the ongoing story. However there is also no doubt that it was the sheer fire and pride within Aloysius in 1926 that took the entire business to levels hitherto unimaginable. Quite simply, Aloysius LIVED for spades but for some reason he would never explain or document, he had an intense hatred for shovels! Over the years there had been many workshops built, improved and abandoned for better premises but Aloysius bit the bullet and built the new factory in 1922 which still stands today although the ground area of the original building has been increased by fifteen fold over the years to cope with world demand for these famed spades. It can be openly said that the previous sleepy north Yorkshire hamlet of Hepstonworthlea, some few miles north west of Denley Moor, has never quite been the same since the Greenhalgh factory produced the very first ‘Surecut Spade’ in 1926 and the rest is a success story few household names of the world can even to come close to equalling! His entire outlook on the future of his passion was changed completely upon seeing the first ‘Surecut’ there before him. In truth he had spent years of thought, designs, trials (and many errors along the way) – it even almost cost him a divorce but the end was to be more than worth the efforts and heartache. In short it was a work of pure art. For the first ten years all ‘Surecut’ spades came inside a felt-lined, lockable oak case together with a separate steel box that contained three ornate and hand-written handbooks namely – ‘Owner’s Manual’, ‘Care and Storage Information’ and ‘Service Record’. The killer blow was the 75-year no-nonsense and fully transferable warranty given providing the service record had been fully stamped throughout usage of the spade. By the mid 1930’s, even the boxed handbooks were said to be worth considerable money on their own. But it was not until 1937 that the aging Aloysius came up with the master stroke of genius by opening the only Spade Custom Shop in the world where his ‘Surecut’ spade was made to order for specific users. This involved his custom team making visits to all parts of the globe in order to take age plus fitness details and measurements of the users in order to tailor the spades to the exact requirements of the individual. One of these distant lands was Japan but Aloysius had no visions at all as to what this market could possibly lead to in the years to come! Aloysius passed away in late 1938 and the Hepstonworthlea factory was soon to be commandeered until 1945 by the government for munitions manufacture, specifically armour plating for the finest tanks the world ever produced. In late 1945 the fresh-faced, young but fiercely determined Wilson Greenhalgh led the company ever onwards. It was Wilson who undertook the influx of foreign business and spent much of his time in the Far East. In 1946 he made his first visit to Japan where some not insignificant sales had already been made to his importer in Kobe. At his first meeting the importer mentioned to Wilson his surprise that the majority of his spades were in great demand by people living in the northern part of the country known as Niigata and also mentioned that demand was then already outstripping his normal import shipments by boat. Surprised at this news Wilson jotted down a list of all the names and addresses of the end users that had already made Surecut purchases and thus made an instant decision to get to the area and investigate just why his spades were so in-demand in what his importer has termed as ‘a truly isolated and barren area’. His first port of call was Niigata City but he drew blanks there until someone saw the addresses on his list and suggested Nagaoka City was a much better bet. Wilson made his way there and the local hoteliers gave him much more detailed information from the addresses which were all in a nearby mountainous area known then as ‘Yamakoshimura’ – a name that Wilson found difficult to get his tongue around – but pointed out it was not exactly ‘an easy place to get around’. 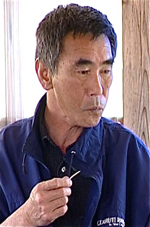 They suggested a train ride to nearby Ojiya City where he may find much better and more localised information. 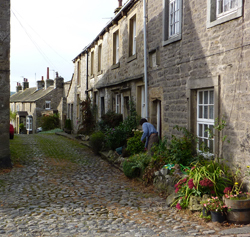 It was there that the local shopkeepers picked up on the addresses in his list and Wilson offered one person some payment to take him to the nearest addresses by car. Fortunately Wilson kept daily notes of his experiences, which much later went on to be published in local periodicals and here are some excerpts relating to this initial visit. ‘Of course it was not wise to mention to anyone at home exactly which countries I would visit in order to drum up more sales for the company and it certainly was unwise to mention Japan. In a way, Surecut had been fortunate in that some of the skilled workers had been ordered to not enlist in the armed forces and instead continue to produce the quality steel we were so rightly famous for. Still these post war years are ‘difficult’ for any company and my duty is to my own company despite the intensity of world hatred towards this land I find myself in now. The larger cities of Japan are awash with U.S. military and their presence is extremely strong and, quite naturally, feared by the majority of the crushed Japanese people. The area I find myself in now however shows fewer sign of the presence of the victors although there are local government offices where instructions are given by the U.S. administrators with regard to utility supplies, road and rail transportation plans and general day to day affairs. Ojiya City, where I have spent some days, is similar to what I would expect to see in the cowboy films we see at the picture houses back home. It is basically wooden houses and wooden walkways complete with wooded awnings as protection from the winter snows of which I am told can be significant. It is a very rare sight to see motor vehicles unless they for transportation of goods, there are certainly very few private vehicles around. My guide for two days was Mr. Hoshino who had a few English words in his vocabulary and our driver who understood none of this was simply known to me as ‘Davy’ (his real name was far too difficult for me to pronounce). We drove early one morning out of Ojiya and headed north in an ancient but well-kept private car loaned to Davy by a friend. It was surprising how quickly we exited the environs of Ojiya and I found myself in a flat countryside area with a range of mountains ahead of us. Soon the narrow streets and roads of Ojiya were replaced by narrower single track roads that took some careful negotiation in parts. It was less than a 20-minute drive before we made our first stop on the roadside of a small hamlet and Mr. Hoshino pointed to a wooden house and simply said ‘Here’. We climbed out and walked over the road to the front door and Mr. Hoshino called out a greeting, after a few seconds an elderly gentleman appeared and ushered us inside after some words had been spoken. The owner’s name was written down for me on paper by Mr. Hoshino as ‘Kawakami’ but not before I caught a glimpse of two perfectly-maintained Surecut spades circa 1932 behind the door. I confess I was truly amazed and proud to see my products in such an isolated part of such a distant land. A conversation began between the two men and soon one of my spades was picked up and discussed in some detail. 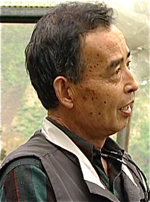 After some time Mr. Kawakami insisted we go further into the mountainsides where a friend had more and some were for sale. He came along with us and soon we were at the home of a ‘Mr. Mano’ who proudly showed us a display of Surecuts that were becoming to be in great demand by the locals of the area who lived deep in the mountains nearby. It was later that day I discovered exactly why my spades had become somewhat of a cult name with the inhabitants of the area and this was because of an activity that was gaining ground in the otherwise traditional rice farming and root vegetable production. This turned out to be fish farming, more specifically carp farming in an area where there was little animal protein available in the long winter months. Apparently the warm summer temperatures were perfectly suitable for growing carp eggs from spring until autumn when they could be harvested, salted and stored to produce a valuable winter food for the locals in the area. The more enthusiastic nouveau ‘fish farmers’ had decided to excavate ponds from the water-retaining clay ground in some areas in order to grow more fry and thus reap a larger harvest. Some of these ponds looked quite large when I first saw a few (which did entail some lengthy trudges over rice paddies) and no doubt they took some hard labour to complete especially as most were deeper than three feet. 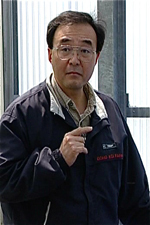 Mr. Hoshino explained that, whilst some locally-produced spades were available to them, my Surecut range had been proven in usage to be both quicker and more precise to excavate and far easier to operate, Despite the fact they were more expensive to purchase initially the spades lasted much longer, some had even mentioned they were almost indestructible. The feedback offered by these mountain farmers gave me a greater understanding and considerably more enthusiasm in my continued attempts to better and expand my ranges of Surecut spades in the future. I managed to see the parent stocks of these black carp at Mr. Mano’s home and was surprised to note that some were larger than expected. A few looked to be well over 14” long. Well, as we all know now, Wilson certainly was not hearing things and coloured carp were being produced back then but only by some as a private hobby. 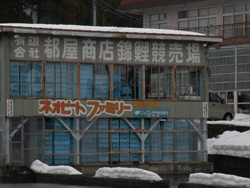 As the years progressed the clay ponds escalated in number and Surecut spade sales to Yamakoshi increased accordingly. It is said that even today the elders of the mountainsides can tell in an instant if an old mud pond has been a Surecut excavation or not. It was to be the development of these fancy coloured carp and the significant pricesthey could command over the food fish that would transform the mountain slopes into thousands of ponds. As more and more rice farmers saw the prices that were being attained and enjoyed by their neighbours, more new breeders came into the industry and thus followed the arrival of excavating machinery into the picture. By the mid to late 1960’s the quiet mountainside became alive with huge and noisy excavators and dump trucks that were scooping out new earth ponds for breeders throughout Yamakoshi. When this news hit Wilson via his main importer in Kobe it certainly had a potential impact on present and future Surecut sales to Japan which could well decimate his world sales and thus reduce turnover and then his bottom line profit. Needless to say, Wilson was back in Ojiya within days of hearing the news of these damned new machines. Bearing in mind that Wilson was now no longer the lithe young 27 year-old man he was on his first visit he was still alert and fit enough to check out ways of fighting back to maintain his vital sales targets that he’d set himself. On that second visit he made a point of contacting and speaking with as many of the fish farmers as he possibly could and noted down their comments as to the pro’s and con’s of pond excavation between his spades and the giant excavators. It was the coloured fish producers themselves (far more wealthy now than the old fashioned food fish producers) who voiced serious doubts regarding the huge blades on the excavators that ‘dragged the top clay downwards and produced a trail of top clay all the way down the incision which actually covered up and sealed the mineral layers of the soil depths and these mineral layers were said to be of utmost importance for the skin, colour and general well-being of these coloured fish. In truth, the excavator’s blades covered up the stratum of minerals in the various depths of the clay by ‘plastering’ them over with top clay and rendering them useless. Wilson wisely paid great heed to those words and made copious notes throughout that visit.On that long return flight to his beloved Yorkshire and Hepstonworthlea, Wilson came up with a solution on the back of a cigarette packet that would and did rock the entire fish producers of Yamakoshi and later the entire coloured carp producers of Japan.Yes that single, God-sent inspiration, oft-said to be ‘inspired’ by the free brandy available on the flight, led Wilson to design the only real ‘SuperSpade’ that could rid the mountainsides of his competition. This was namely the stroke of pure genius when he launched to the world in 1971 -‘The Surecut Slicer’ The Yamakoshi folks abbreviated the name as simply ‘THE SLICER’, to say it was a hit with them is a vast understatement! It was these very people who soon formed and started out the very first ‘Surecut Slicer Supporters Society’ (SSSS) around 1972 and the rest, of course, is just history. 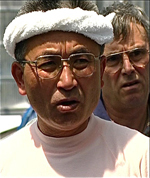 In 1974 the very first ‘Slicer Show’ was staged in the grounds of the Fukushoji Temple in Koguriyama village where Wilson was invited to present the major awards.The comments below from world class coloured carp breeders should more than substantiate as to why this lone Yorkshireman is held so high in their esteem. Some even openly state that had it not been for Surecut, the Coloured Carp Industry would never have got off the ground. ‘Grow my Yamabuki to the size I do in a machine-excavated pond? ‘Nishikigoi and Surecut are synonymous, I assure you that in order to produce perfect specimens it is not possible without that sacred and traditional implement. ‘Listen to me mate, it’s Nishikigoi from Niigata, not these jumped-up second-rate breeders in other areas with their second-rate clay. Do you think I’m going to ruin my clay with a bloody machine? ‘I don’t care which excavator you want to sell me, or what your special discounts are. I’m looking you straight in the eye my friend and I’m telling you, Minoru trained me for seventeen years. If Slicers were good for him, I assure you, they are good for me’. ‘I still have my 1973 Slicer 409, it is still as good as the day it left the factory in Hepstonworthlea. I have visited the factory several times. It has excavated over fifty mud ponds since then and has all the service history. My late father also knew Wilson very well. ‘I confess I once tried a new machine for a free demo ten years back after endless phone calls from Kubota. After the second scoop it started to slide, I jumped off and it’s still in the river below you. I never tried another, why should I? As an aside, it is said that another lone Yorkshireman made visits to the same area some time after Wilson had made his mark. Few can even recall his name today but opinion is, he never really cut the mustard! There’s not much else to add to the enigma that is ‘Surecut’; visitors in their coachloads from all parts of the world make daily factory visits to Hepstonworthlea; there are now‘Surecut Owner’s Clubs’ in most parts of the world; many new owners insist on making the journey to the factory in order to collect their new spade; the success story continues. Here’s the May 2010 ‘Slicer Mk7/449Z – left-handed model. The main shaft is fifty years-old weathered willow and the grip– although stained to match – is solid iroko. Titanium has now replaced the traditional steel embrasure which may cause a few raised eyebrows but we’ll have to wait and see! Price – as always – On Application. The main road through Hepstonworthlea taken in 1973. The lady tending her flowers is a member of the quality control team at Surecut. The Surecut factory is on the left as the main road bends. In 2009 Wilson Greenhalgh’s son Eric took over the company and it is said that Wilson is writing his memoirs. 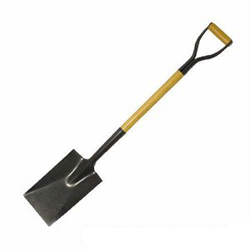 Once a spade man…well, we all know the rest! Footnote: -These texts were genuinely inspired by the late Shoji Tanaka who was owner of Marusyo Koi Farm in beautiful Yomogihira village. 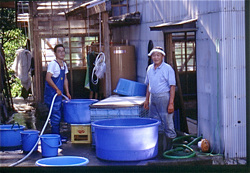 Apart from being an expert Nishikigoi breeder and a person with a wonderful sense of humour, he was also the best Koi salesman I have ever met. No doubt some of his masterly sales techniques rubbed off on one certain Englishman. It was hard to leave Marusyo without at least one purchase when Shoji was on selling form.On many occasions we would talk about the early days in a tiny bar in the village that he’d go every night with his local friends who were mostly Koi breeders. In this bar, the beer would flow and the food was more than palatable. 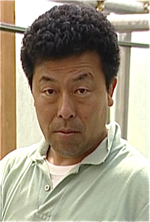 On more than one occasion he’d recall his father who single-handedly dug Shoji’s largest mud pond with a spade. 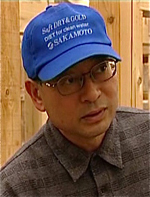 Makoto, his son, who now runs the company, says it is still the largest of the many mud ponds they own today. However, Makoto’s grandfather was by no means unique, there are still many mud ponds in Yamakoshi that were originally hand-excavated by spade in the days before modern-day machinery came along.